Media captionIsrael election: Will voters shift to the right? Israel is holding its most closely-fought general election in years. But he is facing corruption allegations and a strong challenge from former military chief Benny Gantz, head of the centrist Blue and White alliance. Pre-election polls suggested the two main contenders were neck-and-neck and that they would need to rely on smaller parties to form a governing coalition. Negotiations are expected to start soon after polls close at 22:00 local time (19:00 GMT). What is forecast to happen? More than 40 parties are contesting Tuesday's election, but only about a dozen are expected to overcome a 3.25% threshold, allowing them to enter parliament with four seats or more. Final polls suggested Likud and Blue and White would both win about 30 seats. The left-wing Labour party was predicted to come third with about 10 seats, followed by the Arab alliance Hadash-Taal and United Torah Judaism, which represents ultra-Orthodox Jews. 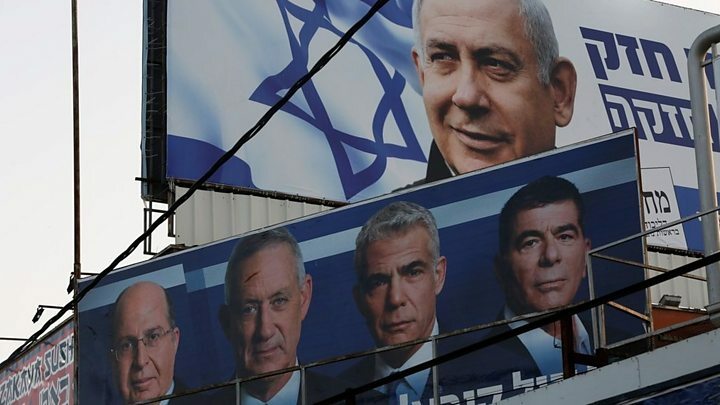 In Israel's fragmented party system the advantage remains with Mr Netanyahu, who still looks most likely to be able to form a new coalition government, says the BBC's Tom Bateman in Jerusalem. On Tuesday, Israeli Arab politicians condemned Likud for sending 1,200 observers equipped with hidden body cameras to polling stations in Arab communities. Hadash-Taal said it was an "illegal" action by the "extremist right" that sought to intimidate Arabs and reduce turnout, but Likud said it wanted to ensure only "valid votes" were cast. A leading pollster said on Tuesday afternoon that he had never seen such a low turnout among Israeli Arabs, who make up almost a fifth of the population. What was Benjamin Netanyahu's pitch to voters? The 69-year-old, who could overtake David Ben-Gurion as Israel's longest-serving prime minister if he is re-elected, called voting a "sacred act" when he cast his ballot in Jerusalem on Tuesday. "You need to choose well, but I can't tell you for whom," he said. "Or I can, but I'm not going to. God willing, Israel will win." At a rally in Jerusalem on Monday, Mr Netanyahu told Likud supporters not to be "complacent" and urged them to turn out at polling stations. He warned that his "leftist" rivals could still win. Our correspondent says Mr Netanyahu has appealed to Israel's increasingly right-wing voter base with tough messages on security and a significant announcement in the final days suggesting a new government would annex Jewish settlements in the occupied West Bank. The prime minister denies the corruption allegations, and says he is a victim of a political "witch hunt" aimed at influencing the election. The 59-year-old retired lieutenant-general is a newcomer to politics who formed the Blue and White in February, promising to unite a country that had "lost its way". Casting his vote in the town of Rosh Haayin, near Tel Aviv, he called on Israelis to respect democracy and "take responsibility". Image caption Benny Gantz has vowed to form a government that would "act responsibly, firmly and decisively"
"Go to vote. Choose whoever you believe in. Respect each other and let us all wake up for a new dawn, a new history that we need to begin," he said. The former chief of staff of the Israeli military can rival Mr Netanyahu on security - one of the election's key issues - and is promising cleaner politics. He told Blue and White supporters in Tel Aviv on Monday that the prime minister wanted to "create a legal fortress to guarantee his legal immunity in front of the serious charges he is facing". Asked about the Israeli election on Tuesday, Palestinian Authority President Mahmoud Abbas told reporters in the West Bank: "We hope they choose the just path, in the right direction, to reach out for peace."